The South Korean Navy is demanding damages from local groups and residents in Jeju Island for “taxpayer losses” incurred by their opposition to the construction of a new naval base. The groups targeted include the village association of Gangjeong in the city of Seogwipo. “On Mar. 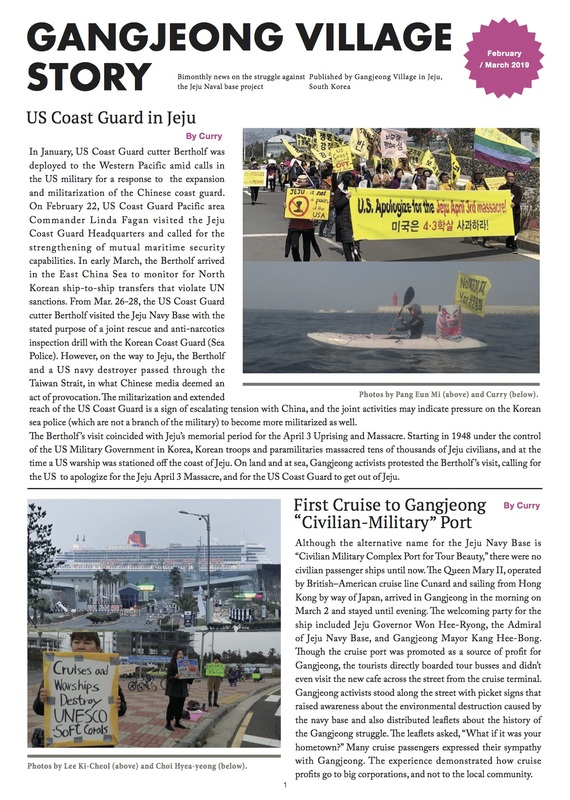 28, we filed a suit with Seoul Central District Court for the exercise of indemnity rights for the Jeju multi-purpose port complex,” the Navy announced in a press release on Mar. 29. “The purpose of this exercise of indemnity rights is to hold those responsible accountable for losses in taxpayer money from among the additional costs of 27.5 billion won (US $23.8 million) incurred due to the [14-month] delay in the port’s construction period owing to illegal obstruction of operations,” it added. The total compensation claim amounted to 3.4 billion won (US$2.9 million) of the additional costs, with the Gangjeong village association listed among the defendants alongside five groups and 117 residents and activities who took action to oppose the naval base construction. Last year, Samsung C&T demanded 36 billion won (US$31.2 million) in compensation from the Navy for delays in the construction schedule; a figure of 27.5 billion won (US$23.8 million) was finally settled on after mediation by the Korean Commercial Arbitration Board. Mediation is currently under way for Daelim Construction’s claim for 23 billion won (US$19.9 million) in compensation. In addition to holding residents and activists accountable for the additional costs incurred by their opposition, the Navy‘s decision to pursue the claim following the base’s completion on Feb. 26 appears intended to send the message that those who oppose state efforts in general will face legal action. 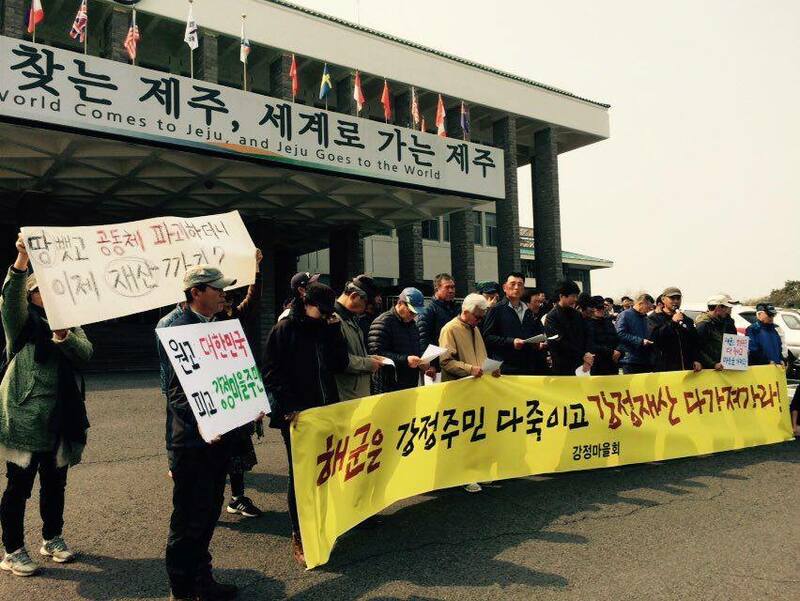 The Gangjeong village association responded with indignation. “We intend to discuss this with residents at the village level,” said association head Cho Gyeong-cheol, adding that legal professionals were being consulted on a response. “The same Navy that said it would be ‘working with residents’ is now demanding compensation, and it hasn’t even been that long since they finished. It’s shameful to see the Navy going on about the ‘shared benefits for residents,’” Cho said. Hong went on to say residents and groups planned a joint legal response with the group MINBYUN-Lawyers for a Democratic Society. In 2007, the administration selected Gangjeong as the site of its naval base construction despite procedural objections over an ad hoc general village association meeting attended only by a portion of residents. The construction went ahead despite the objections of local residents, activists, and religious workers, and was finally completed in February. Around 600 people were prosecuted over obstruction, with some 400 million won (US $346,000) in total fines to residents and activists. Take Action: Please call the South Korean embassy or consulate nearest you and complain about this outrageous action to destroy Gangjeong village. Here is the link to find the ROK consulate nearest you in the US. Do it today!